The British Standard Triumph Builder's Exhaust kit can be used to make your own custom exhaust for any model Triumph, BSA, Norton, or other British motorcycle. This is top quality USA-made steel and includes all the parts to make and mount your creation. 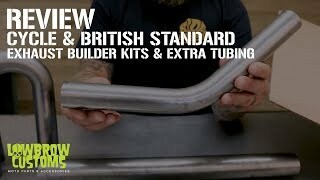 The Triumph Builder's Exhaust Kit is comprised of 1.5 inch diameter, 16 gauge CNC mandrel bent seamless tubing. Made in the USA. Qty 2- 14" straight sections. Qty 2- Small U Bends - 2" radius 180 degree bend (4" center-line to center-line on straight sections). Qty 2 - Large U Bends - 4" radius 180 degree bend (8" center-line to center-line on straights). Qty 1 - Exhaust Spigot Flange Tube - each end is an flared for a secure fit over the motor exhaust spigot. Qty 2- Wing Tabs- Use these bent steel tabs to create additional mounting points for your exhaust. Other things you might find useful are several colors of exhaust header wrap, and if you are building custom exhaust pipes that run high down the side of your bike take a look at our selection of finned, smooth and fish scale aluminum motorcycle exhaust heat shields. These will keep you and your passenger from accidentally burning your leg while riding, plus there is the added benefit of their cool style. I've ordered several sets of exhaust kits from multiple vendors. These take the cake for me. The bends have minimal , if any distortion. Saves a ton of time during fab. Will definitely order again. Thanks! i ordered this for my husband for christmas but it was the wrong ones.